Today’s Hero Of The Day is the AMAZING MAN! 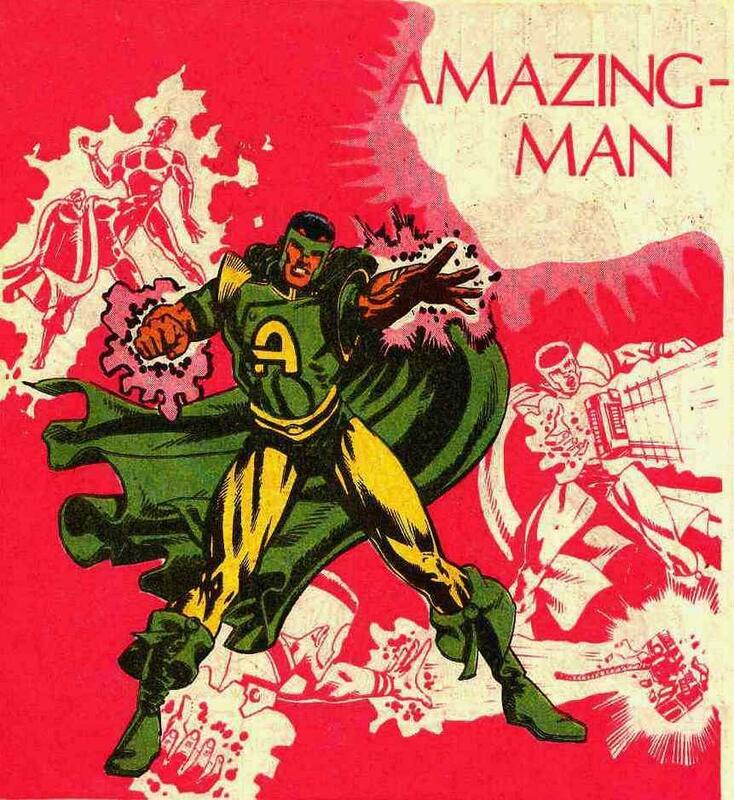 Amazing Man made his debut in All Star Squadron (Vol. 1) #23 – back in July of 1983. His current version’s reappearance was in O.M.A.C. (Vol. 4) #2 – December 2011. Rocker Bonn was an operative of the intelligence agency Checkmate before being transferred to its public subsidiary Cadmus Industries. Subjected to genetic experiments as part of Project Cadmus, he gained the power to explosively incorporate mass and matter, while also taking on their physical properties. Given the codename Amazing Man, Bonn escaped rather than become Cadmus’ tool. Sometime later, while Bonn was in hiding working at a Texas Diner, the rogue sentient satellite Brother Eye manipulated him into battling Kevin Kho, the unwilling host of the Eye’s One Machine Attack Construct (O.M.A.C.). Caught in a confusing three-way battle between the police, O.M.A.C., and himself, Amazing Man was held at bay and, after being tricked into absorbing some of O.M.A.C.s circuitry, was ultimately absorbed into Brother Eye, who deemed the transmorph useful to its own plans. Tricked into combat with O.M.A.C., Amazing Man initially had the upper hand until O.M.A.C. temporarily blinded him.